During the late middle ages the seaside resort of Scarborough in North Yorkshire was an important venue for tradesmen from all over England. It was host to a huge 45-day trading event, starting August 15, which was exceptionally long for a fair in those times. Merchants came to it from all areas of England, Europe, Norway, Denmark, the Baltic and the Byzantine Empire. Scarborough Fair originated from a charter granted by Henry III King of England (Anton's 20th Great Grandfather) on 22 January 1253. The charter, which gave Scarborough many privileges, stated "The Burgesses and their heirs forever may have a yearly fayre in the Borough, to continue from the Feast of the Assumption of the Blessed Virgin Mary until the Feast of St Michael next following". (On the modern Roman Catholic calendar, the equivalent dates are August 15 to September 29.) Naturally, such a large occasion attracted a lot more than just tradesmen; they needed to be entertained and fed, therefore large crowds of buyers, sellers and pleasure-seekers attended the fair. The ballad "Scarborough Fair" appears to derive from an older (and now obscure) Scottish ballad, The Elfin Knight (Child Ballad #2), which has been traced to at least 1670 and may well be earlier. In this ballad, an elf threatens to abduct a young woman to be his lover unless she can perform an impossible task ("For thou must shape a sark to me / Without any cut or heme, quoth he"); she responds with a list of tasks that he must first perform ("I have an aiker of good ley-land / Which lyeth low by yon sea-strand"). As the song spread, it was adapted, modified, and rewritten to the point that dozens of versions existed by the end of the 18th century, although only a few are typically sung nowadays. The most famous version was recorded by Simon & Garfunkel. 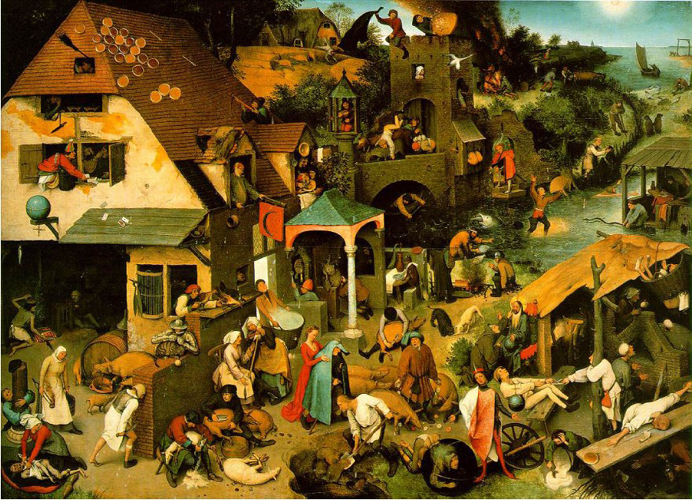 The references to "Scarborough Fair" and the refrain "parsley, sage, rosemary and thyme" date to nineteenth century versions, and the refrain may have been borrowed from the ballad Riddles Wisely Expounded, (Child Ballad #1), which has a similar plot. Anton, The Lord of Hartforth's first name is actually Romero, which means rosemary in Aragonese. Rosemary the herb is not linguistically related to and should not be confused with the girl's name Rose Mary.